Now you can afford that dream house with our Home Loan. Loan up to 80 percent of the property’s value. For example, for a Php 1,000,000 house and lot, you can get up to Php800,000, and pay as low as Php11,750 per month with a repayment period of 15 years. Rebuilding your home? Get the cash you need by using your home as collateral! Loan up to 40 percent of your property’s value. For example, if you have a Php 1,000,000 property, you can loan up to Php 400,000, and pay as low as Php 14, 603 per month for 36 months. Owning your dream car is now made easier! You can loan up to 70 percent of your car’s value. For a Php 400,000 vehicle, we can finance up to Php 240,000! Pay as low as P8,600 per month in 36 installments! Need funds to fix your car? Then use it as collateral for your car loan! If your car is five years or below, you can loan for as much as 40 percent of its value. For example, for a P400,000 vehicle value, you can loan up to P160,000 where you can pay P14,822 per month in 12 installments. To provide maximum financial benefits for employees in need, this hassle-free loan application and loan payment type that is exclusively offered to all regular employees of the PJ Lhuillier Group of Companies nationwide. Specially designed for small-scale agricultural businesses, this loan offers financial support for farmers to increase their resources and expertise. It includes special terms and conditions suitable for small farmers. These are loans offered to microentrepreneurs to help augment their income, improve their livelihood, and uplift their living conditions. With flexible payment terms, our microfinance loan provides limitless possibilities for every client’s business needs. This is a 30-day to one-year term deposit that offers high interest earning potential. It assures clients of interest earnings for as long as the deposit remains in the bank throughout the agreed term. We allow a client’s interest to be withdrawn or deposited to a savings account every month or at the end of the term depending on the depositor’s instruction. This is a tax-free time deposit account with a five-year term. Interest may also be drawn every month or as the depositor wishes (every quarter, every year, at the end of the term or deposited to the depositor’s savings account). This is a term deposit savings account that offers premium rates with flexible maturity period. This kind of deposit comes with a passbook for ease of recordkeeping and monitoring of account transactions. 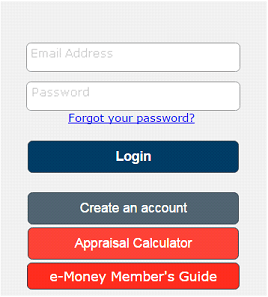 This is a regular passbook-based savings account that can be withdrawn from anytime. This type of account earns an interest of 1% per annum. This is a non-interest checking account with a low maintaining balance requirement. We require clients to shell out an initial deposit of Php 5,000 and maintain a Php 2,000 balance to avail this type of account. An interest bearing deposit product with low initial deposit and has no maintaining balance. It is owned by Cebuana Lhuillier Rural Bank and is being carried by Cebuana Lhuillier Pawnshop as its cash agent. Cebuana Lhuillier Micro Savings is currently available in close to 2,500 branches nationwide and can be availed using 24k Plus Card. 1. THE AGREEMENT. This Agreement governs the relationship between the e-Service Client (the “Client”) and Cebuana Lhuillier Pawnshop (the “CLP”). CLP reserves the right to adjust, modify, amend or supplement these terms and conditions as the service may require without the need of prior notice. The Agreement or any changes thereto shall take effect immediately upon the processing of the e-Service enrollment transaction. 2. THE e-SERVICE. 24k Cebuana Card’s e-Services (Electronic Services) include access to the Client’s 24k Cebuana Card account so that the Client can do inquiries and transactions through the Internet and/or the Mobile Phone, and the use of the 24k Cebuana Card for e-Money transactions. 3. ACCESS TO e-SERVICE. To access the Client’s 24k Cebuana Card account through CLP’s e-Services, the client must have a valid Mobile Phone Personal Identification Number (MPIN) for Mobile Phone, email address and an online password for 24k Online Internet Portal, and biometrics record and a 24k Cebuana Card for e-Money transactions. 4. ACCURACY OF INFORMATION. The Client hereby warrants that all information pertaining to his/her identity and personal circumstances are true and correct. Further, the Client confirms, declares and acknowledges that the mobile phone number and email address provided to CLP is/are owned/in the control of the Client and that, any communication from and to the said mobile phone number and/or email address is and shall be with the knowledge of and within the control of the Client. The Client confirms and undertakes to inform CLP forthwith upon any change in the mobile phone number, email address and/or any other change that may affect the provision of e-Service to the Client. The Client is responsible for verifying the e-Service transaction history details and records to make sure that there are no unauthorized transactions. The Client should likewise review and reconcile transaction records/details for any errors or unauthorized transactions promptly and thoroughly. 5. ACCOUNT AND CARD SECURITY. The Client shall be responsible for the security of his/her 24K Cebuana Card and for the maintenance of the confidentiality of his/her MPIN and/or online password. Therefore, all e-Service transactions and activities made on the 24K Cebuana Card are conclusively presumed to be done by the Client and the Client shall be liable therefor. The Client has the option to change his/her MPIN and online password from time to time as he/she deems necessary. In case of loss of the 24k Cebuana Card, the Client shall immediately inform CLP through the Cebuana CARES Hotlines of such loss within twenty-four (24) hours, via telephone from 9:00 AM to 6:00 PM, Monday to Sunday or thru a written report. Cancellation of the 24k Cebuana Card shall be processed only upon proper authentication of the phone call or the signature in the written report, as the case may be. All activities and transactions made thru the use of the 24k Cebuana Card prior to the report of the loss shall continue to be the liability of the Client. The remaining Reward Points and/or Cash Value in the cancelled 24k Cebuana Card shall be transferred to the replacement 24k Cebuana Card. 6. REFERENCE NUMBER. Each successful e-Service transaction via mobile phone, internet or e-Money shall be evidenced by a system-generated Reference Number, which shall be transmitted to the Client’s enrolled mobile phone number, e-mail address or validation form, whichever is applicable, for records purposes. The Reference Number shall be the basis of the CLP in investigating any complaints lodged by the Client. 7. TRANSACTION DATE. CLP will effect the Client’s transactions, provided there are sufficient reward points and/or cash value available in the Client’s 24k Cebuana Card account. It is the responsibility of the Client to ensure that sufficient reward points/cash value are available in the Client’s 24k Cebuana Card at all times to cover any of the transactions, immediate or scheduled, and that the 24k Cebuana Card is active. Any charges or penalties as a result of an unsuccessful transaction due to insufficiency of reward points/cash value or cancelled card will be the sole responsibility of the Client and shall be for the account of the Client. 8. e-MONEY TRANSACTIONS. 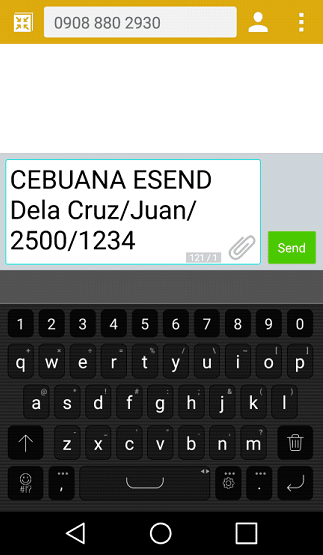 The 24k Cebuana Card, as an e-Money instrument, is re-loadable. The e-Money may only be redeemed at face value. It shall not earn interest or rewards and other similar incentives convertible to cash, nor be purchased at a discount. Further, e-Money is not considered a deposit account hence, it is not insured with the Philippine Deposit Insurance Corporation (PDIC). The e-Money is subject to aggregate monthly load limit of One Hundred Thousand Pesos (Php100,000.00) unless a higher amount has been approved by the Bangko Sentral ng Pilipinas (BSP). All e-Money transactions are subject to the rules and regulations of the Bangko Sentral ng Pilipinas (BSP) and the Anti-Money Laundering Council (AMLC) and all parties hereto are mandated to comply with said rules and regulations. 9. FEES, RATES AND OTHER CHARGES. The use of e-Service via mobile phone and 24k Online facility is free of charge. Only fees for the use of text messages and internet connection shall apply and are payable as agreed upon between the Client and the Mobile Phone/Internet Service Provider. However, CLP reserves the right to impose reasonable charges and the Client hereby authorizes CLP to impose said charges accordingly in the future or in such cases as CLP may deem necessary. For e-Money transactions, the Client agrees to pay other fees and charges and applicable taxes related to the 24k Cebuana Card and its use, as maybe imposed by CLP and/or its partner merchants, such as, but not limited to, remittance, processing, load and encashment fees. Fees and other charges, as may be applicable, shall be inclusive of all applicable Philippine taxes and shall be debited from the e-Money cash value or paid upfront. Should these fees and other charges result in a debit balance in the e-Money cash value, the amount shall be immediately due and demandable from the Client. The amount of fees and charges may be revised from time to time as CLP may deem necessary without the need of prior notice. 10. TERMINATION/SUSPENSION OF e-SERVICES. 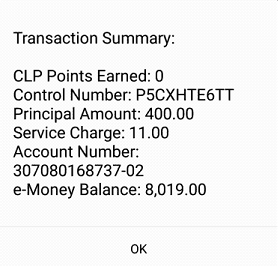 CLP reserves the right to terminate or suspend, either in partiality or totality, the e-Service for any client, without prior notice, and in any of the following instances: a) discovery of any form of fraud; b) violation of any of the provisions of the e-Service terms and conditions and rules and regulations of CLP supplementary thereto; and c) other grounds warranted by law. All reasonable effort will be made CLP to advise the Client of the circumstances of termination or suspension. Restoration of suspended service shall be the sole prerogative of CLP. The Client may request that CLP terminate the access to e-Services permanently by submitting a written request to the Cebuana CARES or any of the Cebuana Lhuillier Pawnshop branches. The Client will remain responsible for any transactions/activities made on his/her 24k Cebuana Card until the time of cancellation. CLP shall not be liable for any and all remaining scheduled transactions that the Client previously set up. 11. DISPUTES ON TRANSACTIONS. The details in the e-Service transaction records are presumed true and correct unless the Client notifies CLP thru Cebuana CARES in writing of any disputes thereon within fifteen (15) days from the date of transaction. If no dispute is reported within the said period, all transactions details and records are deemed true and correct. Disputed transactions shall only be adjusted once the claim/dispute has been properly processed, investigated, and proven to be in favor of the Client. 13. DISCLOSURE. CLP shall keep all 24k Cebuana Card e-Service enrollment files in strictest confidence. CLP may, however, obtain, exchange or release information to its associates, affiliates, subsidiaries, officers, employees, agents, lawyers and other consultants, pre-paid/debit/credit bureaus or any such persons as CLP deems necessary, or as required by law, rule or regulation. 14. EXCLUSION FROM LIABILITY. CLP makes no warranty, express or implied, regarding the performance of this Agreement or the e-Service functionalities or other services offered hereunder. The 24K Cebuana Card e-Service is offered on an “AS IS” or “AS AVAILABLE” basis without warranties of any kind, except those required by law and other rules and regulation issued by pertinent government agencies. CLP further makes no warranty (1) as to the content, quality or accuracy of data or information provided by CLP hereunder or received or transmitted using the e-Service Channels; (2) as to any service or product obtained using the e-Service; (3) that the e-Services will be uninterrupted or error-free; or (4) that any particular result or information will be obtained. CLP shall not be liable for any loss, added cost, compensation, damage or liability that the Client may incur as a result of any delay, interruption or termination of the e-Service transaction whether caused by administrative error, technical, mechanical, electrical or electronic malfunction or any cause beyond CLP’s control (including but not limited to acts of God, labor disputes, failure of communication lines, interconnection problems, mobile phone signal/reception problems, interference or damage by third parties). 15. LIMITATION OF LIABILITY. Subject to the provisions herein, if CLP is found liable for any act or omission for any reason whatsoever, the liability of CLP shall be limited to the amount of the relevant transaction or actual damages to the Client, whichever is less. CLP shall not be liable to the Client for any indirect, special or consequential loss or damages arising from the use of 24k Cebuana Card e-Service. 16. GOVERNING LAW. This agreement shall be governed by the laws of the Republic of the Philippines and all suits arising from this agreement shall solely be cognizable by the proper courts of Makati City. Click Money Remittance Using e-Money. 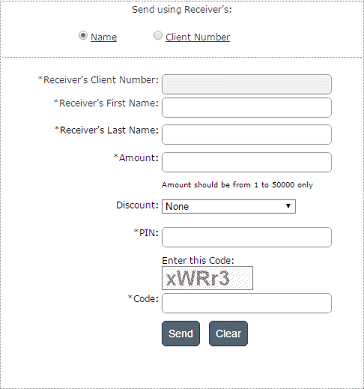 Select if you will send money using the Receiver’s Name or Client Number. 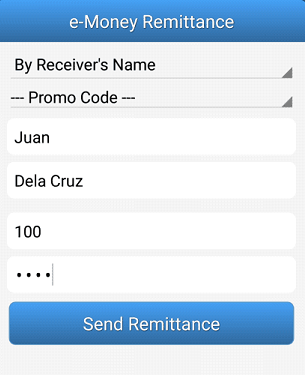 For sending using the Receiver’s Name, type the First Name and Last Name of the receiver and the Amount of money to be sent. 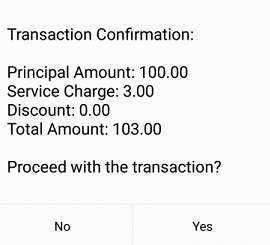 For sending using the Client Number, type the Client Number and the Amount of money to be sent. Select a Promo Discount (if applicable) from the dropdown list. Type your PIN and the Code displayed on the screen. 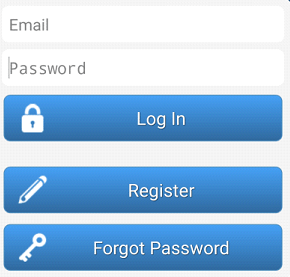 Open the Cebuana Lhuillier Mobile Application and log-in with your account. 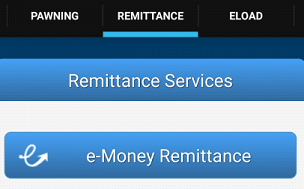 Tap the REMITTANCE tab then tap e-Money Remittance. Accomplish the required fields then tap Send Remittance. Proceed with the transaction by tapping YES. 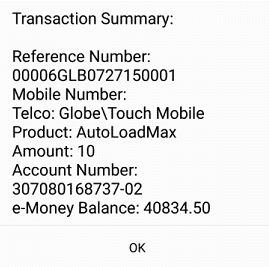 View the Transaction Summary for the remittance control number then tap OK. 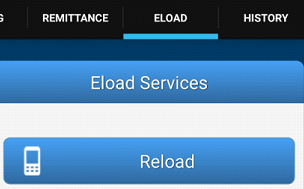 Tap the ELOAD tab then tap Reload. 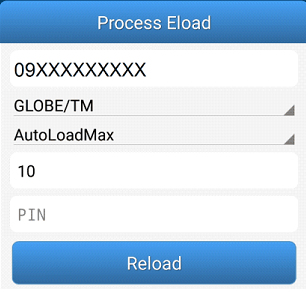 Accomplish the required fields then tap Reload. Construct a text message using the syntax below. Send the text message to the assigned number. Remedios Pornillosa wanted to expand her business, but, her age prevented her from applying for a loan from other banks. With Cebuana Lhuillier Bank, she was able to apply for a loan worth P6,208 with initial savings of P1440. Her business grew and she was able to loan P25,000 for the fifth time. She used the money to buy an additional freezer. She took advantage of the El Nino and sold ice and ice water. Ice and Ice water gave her additional P300-400 in sales. The profits she gained helps her and her family pay for their different bills and weekly amortizations. Through her added income, she was also able to send her son to college again. Her son stopped going to school due to financial setbacks. Remedios has been a Microfinance member since September 1, 2008 and a former client of the Micro MABS, where she was able to apply for a two-cycle loan worth P150,000. She is a loyal customer of Cebuana Lhuiller Pawnshop and Pera Padala. Reynaldo Saquilayan spent 20 years as an Air Traffic Controller in Dubai. He was able to save enough money to buy several properties in the country. He had no steady source of income when he retired. He returned to the Philippines with the intention of constructing a commercial building; but, his money was not enough. He applied for a loan in Cebuana Lhuillier Bank. To this day, Reynaldo is thankful to CLB for providing him the means to build his five-door commercial building, which he rents out businesses. With Cebuana Lhuillier Bank, Reynaldo now has a stable source of income in his retirement age. and licensed as an Electronic Banking and Electronic Money Issuer. – is the accredited 3rd party service provider of the CLRB. the terms and conditions for regular deposit accounts shall apply. by the Bangko Sentral ng Pilipinas (BSP). digit code used to access the account and make transactions. true and correct. The Client hereby allows the Bank to verify said information. may be issued by CLRB and for the maintenance of his/her PIN and/or online password. is applicable, for records purposes. be for the account of the Client. a written request to the Cebuana CARES or any Cebuana Lhuillier Pawnshop branches. from the above actions of the Bank. has been properly processed, investigated, and proven to be in favor of the Client. problems, interference or damage by third parties). but not limited to lost opportunities or profit. of 2001) and acknowledges that his/her account is subject to the provisions of R.A.
No. 9160, including any and all amendments, rules or regulations pertaining thereto. information will accordingly be shared. infoprivacy@pjlhuillier.com. Client is encouraged to visit https://privacy.gov.ph to know more about R.A. 10173.
and voluntarily given and are true and correct to the best of his/her knowledge. to any concerns that may arise out of this transaction. a result of such disclosure. for up to the maximum amount of Five Hundred Thousand Pesos (Php500,000.00). interest income on savings deposit (P.D. 1994). and/or may be requested thru SMS. reasons it may deem proper, amend, revise or modify these Terms and Conditions. receipt of the individual notice or thirty (30) days from issuance of public notice. by the Client of any such amendments, revisions or modifications. be given in writing by the Client to the Bank. are binding on the Client and his/her heirs, executors, administrators and assigns. of the proper courts of Bacoor, Cavite.